Convection can be defined as a way energy transfers through glass . 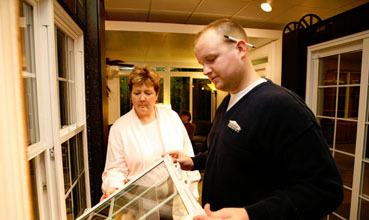 Especially in northern central climates, warmer air reacts with the cool inside pane of your windows. The air is cooled and becomes denser. This cool, dense air then drops to the floor and is immediately replaced by more warm air. You may think of this as a cold draft coming from your windows but it isn’t. When this occurs many people think they should turn up the heat. If you do this you can see drastic changes in your energy use, even a 1-degree increase in temperature can increase your energy use by up to 2 percent. The best alternative to turning up the heat is buying new windows to cut down on this convection process. These features can help to raise interior glass temperature, slow convection and basically improves the overall comfort and feel of your home. Those new windows can help decrease the presence of convection, but it can still occur. These features will help to minimize the effects of convection in your home. Please enter the number 93712 in the box provided below.